Mead's Green Door Café is a vegetarian/vegan café located in Old Towne Orange, California. The café doors opened in January of 2013, but the Mead family has been serving the Old Towne community with great food in a fun family atmosphere for over 20 years. Starting with PJ Mead's Book and Coffee where PJ (owner Peggy Jane) started serving her amazing baked good to the locales of Orange. Then came PJ's Abbey Restaurant where Gary Sr. restored a beautiful 100 years old church and offered great food for people to enjoy at special family dinners. Now Gary Jr. has created a meatless menu full of flavor that satisfy all. The Green Door symbolizes a greener way of living where we can nourish our bodies in a way that helps raise the vibrations of everyone that enters. First and foremost, we make delicious food. For some, it's hard to imagine delicious food that doesn't have meat in it. We're here to say that it is possible. Whether you are a meat-eater, a vegetarian or a vegan, you will find something to love at Mead's Green Door Café. We take pride in our menu, which features distinctive recipes developed with flavor (not just meatlessness) in mind. Check out our menu – there's a breakfast, lunch or snack in there for you somewhere. Our café is already a generational business; we want it (and our planet) to be viable for generations to come. We recognize that resources are precious, and we strive to use them wisely. Wherever possible we use environmentally sustainable products, from recycled paper goods to locally grown produce, and we celebrate other businesses that do the same. Since eating is almost as much about relationships as it is about sustenance, we know that good atmosphere is important. Sure, the Green Door Café is colorful and open, but atmosphere comes from people, too. Our café is staffed by bright people who work hard and have fun doing it. Our goal is for every customer to feel the fruits of that hard work and fun, and hopefully they will take those good vibes with them when they walk out our doors. Great coffee starts with quality beans intelligently roasted mere days before it is brewed. We serve incredible coffee for true coffee lovers, roasted by local artisan Old Town Roasting. We are proud of our partnership with owner and head roaster Shawn Anderson, who shares our philosophy of offering delicious products that are responsibly grown, processed and brought to market. He gives 20% of his profits to fund micro-loans that support conscientious coffee farmers around the world. 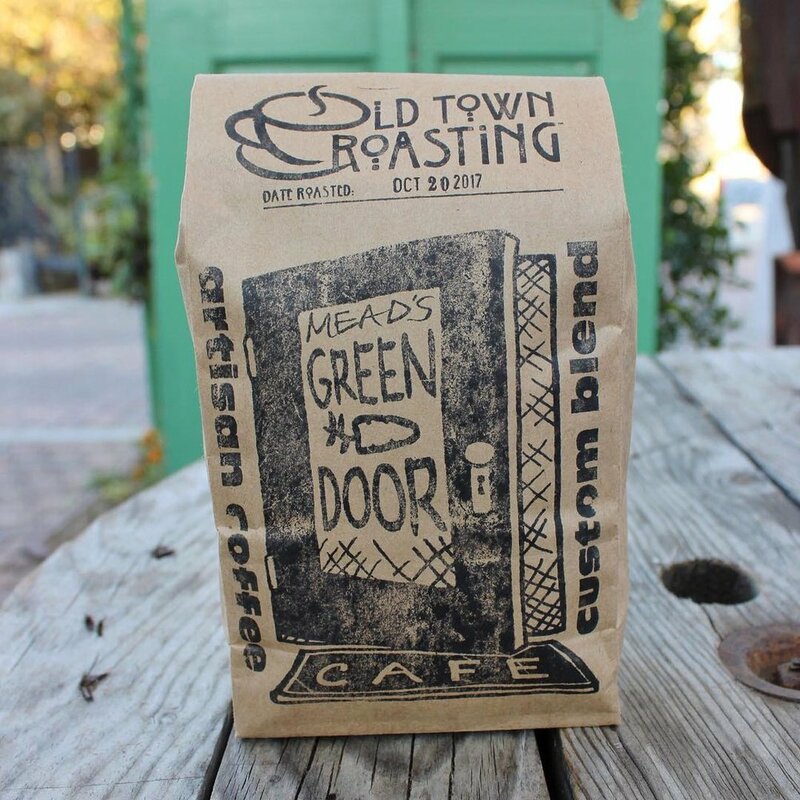 The world needs more businesses like Old Town Roasting... and it needs more coffee like what we serve at the Green Door Café. Gary Mead, Sr. sees opportunity. It is what made him an entrepreneur, but it's also what makes him an artist. 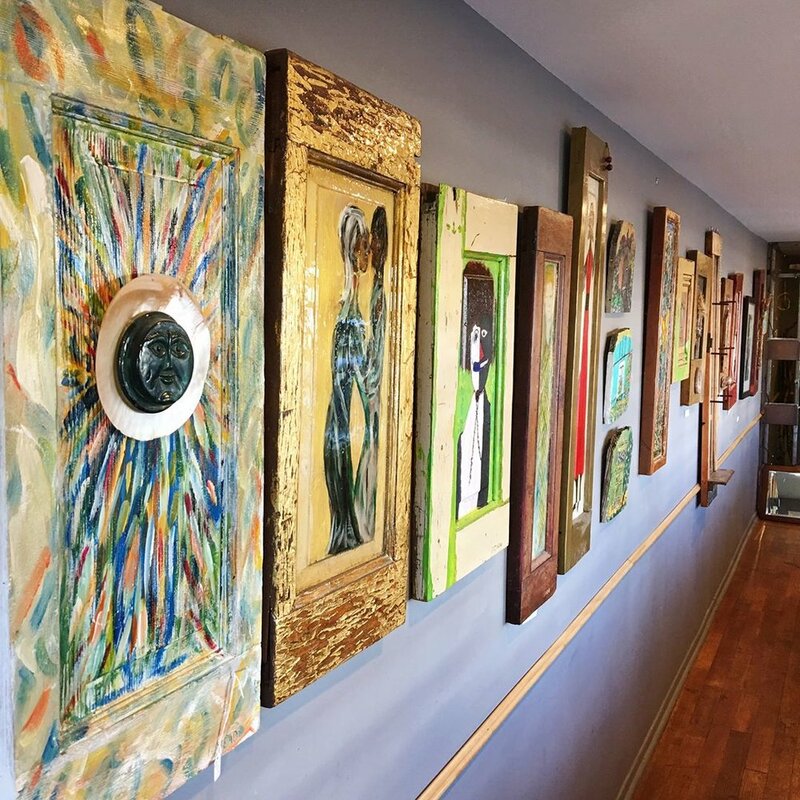 All over the Green Door Café you see lively, colorful, rustically framed artworks. Gary's mediums are salvaged wooden doors. For Gary, a door panel presents a canvas with a ready frame. His subjects range from figures to landscapes, from creatures to boats and beyond. Some of the artwork is available for sale, so if it catches your fancy, feel free to inquire.